I'm actually out of town for a couple of weeks, so there won't be any updates for a while. Wow, that looks amazing, great job! Ok, I’ll pull the latest source again and see if Incan do something with it. If it is not used for collision detection or something, could it be removed? Now that you mention it, please note in the same images that Bruce is not symmetric rightly in that part. And in my opinion the one that makes sense is the left one. The right one has the legs too much opened and it doesn't correspond to reality when doing that kick. You guys never understood the hidden powers of Bruce Lee. To be black in Atari version, it should by of double width. The black player graphics is in double width mode when kicking, but some of the black pixels are covered by the orange player, which is in normal width, so the eyes seems to be of only one pixel each. I've just checked from sprites.asm file: spr_34 (orange) combined with spr_35 (black). Oh! What I don't see in spr_34 is the pixel that disturbes me!!! It should be 4 bytes under the end of the orange part in dta, but that byte is skipped in the sprites.asm listing. The new version of the data.asm. I erased the pixel to try ... Tell me what you think. But it seems that the data.asm file is not the new version,l because the pixel is still there in PM034 and PM038. And about symmetry, PM035 do not only differ to PM039 by the pixel in "that part", there are differences in other hidden pixels (behind the orange player). Anyway, to visually be the same (opposite), byte at address $8445 should be $4D instead of $45, as I agree José in what should be the best. Looks good to me, a little question, how far away is connecting screens...Known or still WIP? Just binge'd this whole thread. 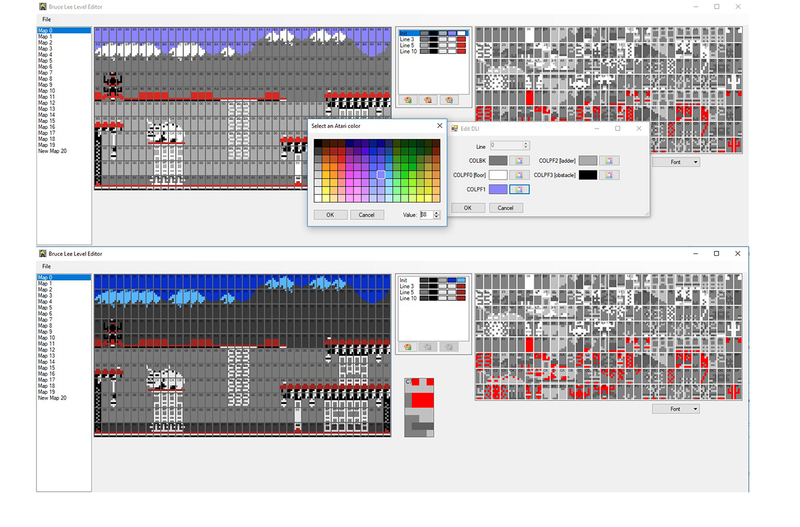 Really amazing work on the graphics, level editor, source code commenting and reverse engineering; everything! Fantomas has been hard at work on the level editor while I was out of town. 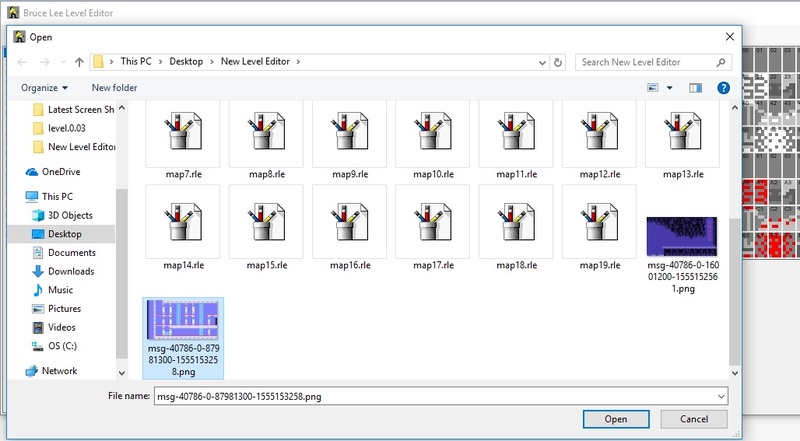 Level editor now includes a font/character editor, a way to add or remove DLI's, the DLI's are editable, and you can now add maps from bitmap images. Release available on Sourceforge. I encourage people to try it out. Lots of fun. Edited by Ute, Mon Apr 15, 2019 5:07 PM. Just a quick demo showing how fast it is to change colors with the DLI editor. Day quickly becomes night. Hats off to Fantomas! Still work in progress Paul, but new level editor changes should make it happen a lot more quickly. I've made a small video out of one of files, good luck with the game!